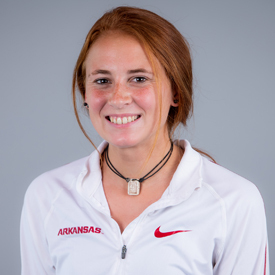 Began her sophomore year at the UC Riverside Invitational (Sept. 16) finishing in second overall and first for the Razorbacks at 17:32.60 … She continued her season at the Chile Pepper Festival (Sept. 30) finishing eighth overall at 17:14.80, the third-best time for Arkansas. First meet as a Razorback was the Cowboy Duals (Sept. 1) posting a time of 10:55.10, good enough for 12th overall … Continuing her season at the Riverside Invitational (Sept. 17) clocking a 17:48.29, a fourth-best time for Arkansas and seventh-best overall … Finished 10th for the Razorbacks and 17th overall clocking a 17:03.98 at the Chile Pepper Festival … Reed competed in the 6K open contest at Pre-Nationals and finished 10th overall at 22:10.70 … During the SEC Championship, Reed produced a 21:38.20, helping the Razorbacks to claim the SEC title. Four-time Texas cross country All-State selection … Captain of the 2016 Texas 6A cross country state champion team … Bronze medalist in the 1,600 at the Texas 6A State Championship (2016) … 2014 Nike Cross Country Nationals qualifier … Has personal bests of 4:49.22 (1,600), 10:19.36 (3,200) and 17:16.29 (5K). Born on May 24, 1998 … Daughter of John and Dawn Reed … Has one brother, Carter … Majoring in business.